We thought you might enjoy a little “sick of snow and winter” humor. I took Frankie outside yesterday to take pictures of him in his new coat. He loves to be outside, but I don’t think he really liked the snow. 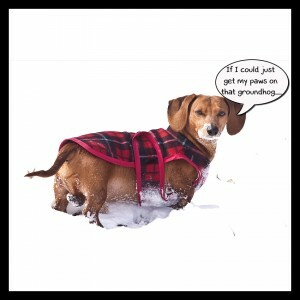 We do have a groundhog that lives in our woods, so I could just imagine Frankie wanting to get his “paws” on him! I may have move in with my brother to get a little sun.